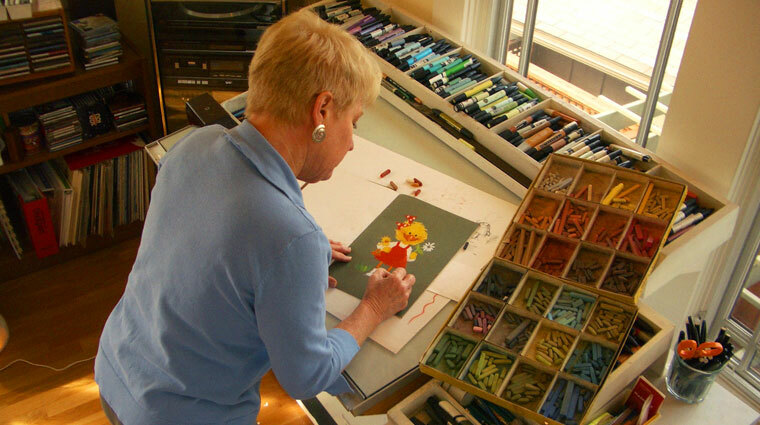 Suzy Spafford is best known for creating “Suzy’s Zoo,” a line of colorful animal characters known as Suzy Ducken, Jack Quacker, Corky Turtle, Ollie Marmot and many others. They are familiar to most people as greeting cards, stickers, calendars, note cards and school décor, as well as in many titles of children’s books.Suzy developed her unique line of animal characters during the 1960s while an art student at San Diego State University. During that time, Suzy exhibited her watercolors, lithographs and whimsical pastels in many local outdoor art marts. She developed a following for her colorful animal characters and was soon discovered by an entrepreneur who suggested they form a company and have her drawings of frogs, turtles, ducks, owls, mice and many other animal characters “doing things people do” printed up as blank note cards. Suzy’s Zoo hit the greeting card market in the spring of 1968 and soon made its way across the United States in card and gift shops via a network of independent sales representatives. Suzy’s Zoo has staying power all these 50 years in the industry and is readily recognizable. It has its own niche and is now licensed into a much wider variety of products here and in many other countries. Japan has been an especially important market in recent years, with the baby duck Witzy and his stuffed animal friends being quite popular. Suzy’s Zoo is presently being developed into an animated series for children, ages 4 to 7. Watch for “Adventures in Duckport” to hit the airwaves in Spring 2019.